correct as of 31 January 2013. Nicholas John "Nick" Evans (born 14 August 1980 in Auckland, New Zealand) is a New Zealand rugby union footballer. He plays fly-half and fullback. He joined Harlequins for the 2008–09 Guinness Premiership season, and has remained with the club since  on a deal reportedly worth £320,000 a year. Evans was born in North Shore City in New Zealand, and attended Westlake Boys High School, where he played first five-eighth (fly-half) for his school's First XV. He played both rugby union and Aussie rules football at the school. Evans graduated to the NZ under-21 and senior Aussie Rules Football sides, competed against state teams and was offered a trial with the Sydney Swans., turning it down to commit his future to rugby union. Although he has grown since, he was at the time considered short for professional Aussie Rules at 176 cm. He later decided to commit to rugby union and played for the Highlanders in the Super 14 and for Otago in the National Provincial Championship. However, on 25 May 2007 Evans announced he would not be re-signing with the Otago Rugby Football Union and would either sign for a Union closer to his family on the North Shore, or become one of many New Zealand rugby players heading overseas if he did not make the All Blacks World Cup squad. He decided to move closer to his family. After impressing in both provincial and Super rugby, he made his All Blacks debut aged 23 against England in 2004. In his last game against Wales when he came on as a replacement for Carter, he broke the line with his first touch (off first phase, a very rare occurrence at international level) to set up Sitiveni Sivivatu for an easy try underneath the posts. Evans was selected in the 30 man New Zealand Squad at the 2007 Rugby World Cup. He started at first five-eighth against Portugal in a game which New Zealand won 108–13, and in the process accumulated 33 points via 14 conversions and a try. He played in the game against Scotland, having been summoned from the bench to play at fullback and looked very handy. He was rewarded with a further start at fullback against Romania and scored 17 points through a try and six conversions. Evans was overlooked for New Zealand's 2008 Tri Nations series. After signing with English Premiership side Harlequin FC, he has become ineligible to play for his national side due to the NZRU's policy of only selecting players within New Zealand to play for the All Blacks side. Since joining the Harlequins, Evans has been a chief architect of on-field success of the club. He was instrumental in the Harlequins back-to-back defeats of Stade Français in the Heineken Cup and helped salvage a draw for his side in their Boxing Day clash with the Leicester Tigers in the Guinness Premiership. During the 2010–11 season Evans has continued his on field success at Harlequins with his most notable performance coming in the European Challenge Cup, putting a man of the match effort against London Wasps in the quarter finals and kicking the winning conversion in the final against Stade Francais. 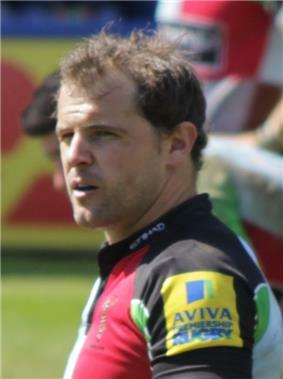 Evans signed a new contract with Harlequins to see him with the club until 2013. ^ "Harlequins 1st XV". web page. Harlequins. 2011. Retrieved 13 June 2011. ^ "Quins sign Nick Evans". Quins. 5 May 2008. Retrieved 5 May 2008. ^ Stafford, Ian (27 December 2008). "Harlequins 26 Leicester 26: Evans delivers on time again". Daily Mail (UK). Retrieved 28 December 2008. ^ "Harlequins 32–22 Wasps". BBC News. 8 April 2011. England, South Africa, London Irish, Wasps RFC, Saracens F.C.